This was my first time seeing Dr. O and it probably was my last. It was my first visit to agynecologist and she did not make me feel comfortable and the appointment felt very rushed. It seemed like she had better things to do. This was my first time seeing Dr. O and it probably was my last. It was my first visit to a gynecologist and she did not make me feel comfortable andthe appointment felt very rushed. It seemed like she had better things to do. Crystal run in West Nyack wait times are the worst. Waited over an hour to be seen. Nice receptionist who keptchecking up on what was going on. Makes me think twice in going back. Crystal run in West Nyack wait times are the worst. Waited over an hour to be seen. Nice receptionist who kept checking up on what was going on. Makes me thinktwice in going back. 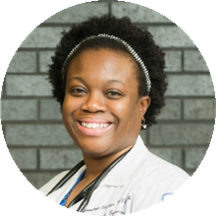 Olufunmilayo Odunuga is a mindful and engaged OB-GYN in Pomona, NY. Dr. Odunuga obtained her medical degree from the State University of New York, Buffalo. She completed her residency and internship in obstetrics and gynecology at Strong Memorial Hospital. Dr. Odunuga is a part of Crystal Run Healthcare and is board certified by the American Board of Obstetrics and Gynecology. Her areas of special interest include public health, polycystic ovarian syndrome, and minimal invasive surgery. In her spare time Dr. Odunuga loves to travel, spend time with family and friends, and attend Zumba classes. Dr. Odunuga is uncompromising in her dedication to the well-being of her patients. She is committed to giving the best care and establishing long-lasting relationships with them. Dr Odunuga is by far the best ! So happy I found her ! She is a really excellent doctor. Dr. O was an absolute sweetheart and made me feel comfortable and explained everything really well to me! I haven’t been to a gyno in years because I just hated the whole experience but now with her I won’t ever wait years again! Dr. O is amazing! I hope to have her as my doctor every year! I’m 61 and hadn’t been to a GYN for about 5 years, so long overdue. Having a female doctor was really a bonus and Dr “O” made me feel comfortable with both Pap smear and breast exam. Extremely professional and thorough.Feel fortunate to have found her through this ZocDoc platform. The office is in a wonderful location too with the most up to the minute technology. LOVED THIS APPOINTMENT!! Awesome. She was friendly and she spent time and answered my questions. Very happy and glad that I found a doctor I’m comfortable with. She is very nice and knowledgable! She made my first visit very comfortable. She explained all the procedures being done and their purpose. We love her. ?? Dr. Odunuga is an amazing woman. I was in her care for my whole pregnancy, she has delivered my child (36 weeks early, surprise!) and I have continued my visits with her for my annual care. She is so caring andinvolved in your care. Even when my pregnancy got alittle rough she was always supportive and positive. Love being in her care. She was good at sharing information and clearly knowledgeable but I felt a bit pressured in to my final contraceptive choice. Waited 30 minutes past my appointment time and then a total of 30 minutes waiting in exam room not seeing anyone. This was my first time meeting Dr O and I was very impressed. Her beside manner and professionalism I would rate 10/10. She was very knowledgeable, pleasant to speak with and told me exactly what she was going to do before she did it. Dr Odunuga is awesome! The best gynecologist I've seen. Highly recommended! She's a wonderful caring doctor. She was gentle and thorough in my check up. Thank you dr. O. REALLY NICE DR , LITTLE SHOT MY APPOINTMEN BUT OK.